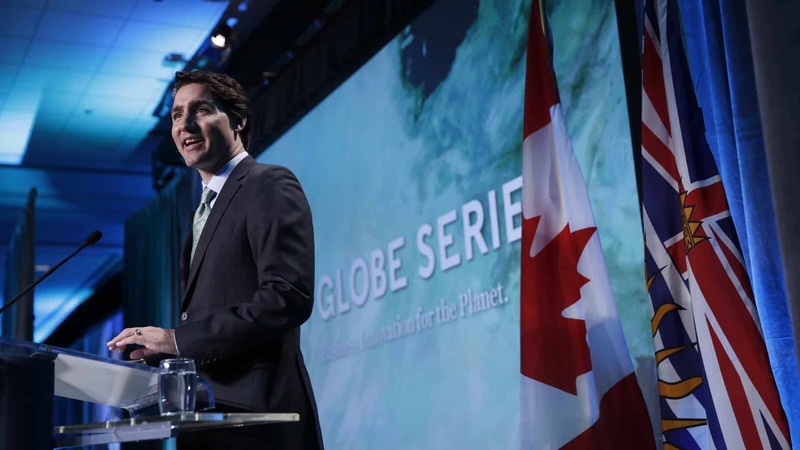 Newly elected Canadian Prime Minister Justin Trudeau was one of the champions of last year’s COP21 climate talks in Paris. Trudeau and his Liberal government led by example, being very vocal and borderline aggressive in the fight against climate change. Twelve months later, despite concrete steps that currently put Canada on track of meeting its domestic greenhouse gas reduction targets, the government is also seeking to significantly expand its fossil fuel exports by opening new pipelines and a massive new natural gas exploitation project. This twin pursuit has been called out by environmentalists who held a press briefing at COP22, Marrakech, Morocco. The panel references the Canadian government’s recent approval of a massive liquefied natural gas project in British Columbia. The $11 billion project will be one of Canada’s largest natural resource development project. Yet, despite the reassuring statements made by Natural Resources Minister Jim Carr that the new exploitation will respect 190 legally binding environmental conditions, the public wasn’t convinced. Rankled environmentalists and some First Nations expressed concerns that immense amounts of greenhouse gases will be expelled, while local fisheries and habitat will be threatened. “I think Mr. Trudeau made the biggest mistake of his career … he’s not as straightforward of a guy as everyone perceived him to be,” said Donald Wesley, a hereditary chief with the Gitwilgyoots tribe, vowing also to pursue legal action. According to the COP22 panel, the Petronas LNG project in northern British Columbia will pump 4.3 million tonnes of equivalent CO2 emissions annually for decades to come. Then, there’s the matter of the controversial Keystone XL pipeline from Alberta to Gulf Coast refineries, which the Liberal government currently in power supports. The KXL pipeline was blocked by U.S. President Barack Obama because it doesn’t meet his nation’s current pledges for reducing greenhouse emissions per the Paris Agreement. President-elect Donald Trump and his cabinet, however, favour KXL. Trump also has the backing of the Republican-controlled U.S. Congress and House of Representatives, and once he takes office in January, President Trump is expected to green-light the project. With both sides in accord, there doesn’t seem to be anything keeping KXL from moving forward. All of this doesn’t seem to bode well with Canada’s pledge for cutting emissions by 30 percent below 2005 levels by 2030. The government’s plan includes energy efficiency measures but also a nation-wide carbon tax starting at $10 per tonne in 2018 but gradually incremented to $50 per tonne by 2022. Catherine Abreu of Climate Action Network Canada stated in Marrakech, however, that Canada’s current plan indeed puts the nation well on track to meet its pledges. At the same time, though, its planned oil exports will not only offset, but possibly worsen the domestic progress. In December, Minister Carr and the Liberal cabinet will decide whether or not to expand the Kinder Morgan’s Trans Mountain oil pipeline from Alberta to Burnaby, B.C.The $5.4-billion project would increase the capacity of the system to at least 890,000 barrels per day. This additional capacity will go to Asian markets. “It’s a goal of the government of Canada to expand its export markets,” Carr said in a statement. A bigger Trans Mountain pipeline would add 14 to 17 million tonnes of equivalent CO2 emissions per year. To put things into perspective, Canada’s plans to cut emissions through a carbon tax will reduce emissions by some 18 million tonnes when fully implemented in 2022. In other words, Canada seems to have no problem in meeting its emission reduction targets, but by exploiting new resources and exporting these to new markets, on a global level they might actually perform worse than a business as usual scenario. It seems unbelievable, but this cabinet pretends these new oil and gas exports will become someone else’s problem. “Canada is on a pathway to reduce domestic emissions and meet the 2030 targets domestically while also increasing the amount of fossil fuels it exports,” Abreu said in a statement to the press.